While English remains the dominant language people learn in addition to their mother tongue, an ever-increasing number of students are learning Asian languages. A survey at Zayed University (ZU) showed Korean and Chinese as the most desired languages to learn. Asian languages look more appealing to ZU students this academic year than it was last year, said Christopher Brown, founding director of International Language at ZU. More than 600 students expressed interest in Asian languages this year, a sharp increase from last year. ZU founded the International College in 2009 with two major institutes established with a focus on Asian studies. The King Sejong (Korean) and Confucius Institutes (Chinese) began a diverse programme of language training and cultural awareness programmes to promote languages and cultural exchanges. When asked about the reason for the focus on Asian languages, Brown told Gulf News, "The rise of South Korea, China and Japan, along with the strengthening relation between the UAE and these nations, are good reasons for ZU to help prepare the Emirati work force for their interaction with these countries." "Giving the young people of the UAE a chance to learn about Asia will help them to distinguish themselves in a competitive job market," added Brown. "Learning a new language is hard work but it is worth the effort as it's a discriminator in a competitive job market," said student Mariam Al Tamimi, 20. It is never too late to begin and continue learning, she said. "This is my last year in college and I didn't want to miss the chance to learn a new language. This will help me stand out when searching for a job," said Aisha Al Nessabi, 20, a Chinese language student. "Learning Korean is not as hard as one would think. The written language is simple, logical and totally phonetic," said Donald Glass, coordinator at King Sejong Institute. ZU students are increasingly enthralled by Asian culture. "Japanese animation, Chinese tea ceremony, martial arts and music are aspects that caught international interest, particularly among the young generation," added Brown. "I am fascinated by the history of China and the rise of this country to become a major exporter of goods to the world. So, I wanted to learn the language and culture of this great nation," said student Sandra Owaida, 26. There are many similarities between the UAE and countries in east Asia. "Family ties, respect for elders, preservation of calligraphy, incense rituals, are all aspects of Asian behaviour and culture that resonate well with the culture of UAE," added Brown. The government of China offers one scholarship yearly. Students must complete 60 hours of language learning and pass an examination to be eligible for a four-week intensive study course in China. 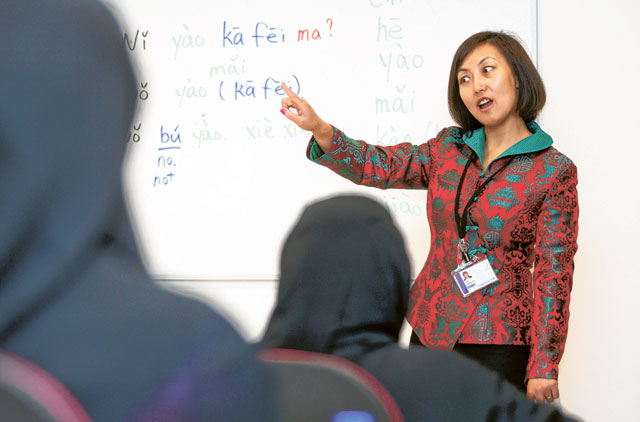 Asian languages classes at ZU are offered as an extracurricular activity without college credit. Programmes are currently offered in two levels with intention to add advanced levels in the future. Programmes also include cultural activities like film festivals, Asian concerts, calligraphy and tea ceremonies. "I'm proud that my language is gaining such high interest," said Jenny Tang, Director of Confucius Institute. Community classes are offered for children and adults in the afternoon and evening. About 400 people are now registered to learn Korean, compared with only 50 last year. Community classes are offered from Sunday to Wednesday, 5pm - 9pm. Those interested may contact: kingsejonginstituteauh@gmail.com or Donald.glass@zu.ac.ae.